Pickup truck lovers know that the cab has to be comfortable just like the engine has to be powerful for it to be a great truck. The Ford F-150 Raptor has everything you could possibly want in a high-powered truck, and the refreshed design has caused many drivers to look twice at the Ford brand. While Ford has always been on top for its truck lineup, the Raptor has a new hearty look that pulls off rugged and sporty at the same time. The head lamps, fog lamps, and grill have all been updated in the latest design. While the cab is bigger, the truck feels a tad wider with more room for drivers and passengers in the cabin. The new design also has insane power, getting up to 450 horsepower with some of the premium models. 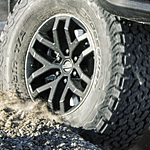 In addition, the all new shocks feel great when bounding over gravel and rugged terrain. Want to test out the latest design? Stop by Arrow Ford Inc. to get a look at the new Raptor.